Fill a kettle with freshly drawn cold water, filtered water is recommended because the quality of your water will directly affect the taste of your tea. When the water is near the boiling point, pour a little into the teapot, swirl around, and tip the water out (this leaves your teapot hot and clean). Next, measure the tea carefully into your teapot, allow one rounded teaspoon full, or one tea bag for each cup required. Many people prefer using a tea ball or filter to keep the leaves from floating throughout the teapot. Bring the water to a rolling boil. Do not allow it to boil too long (it will boil away some of the flavor-releasing oxygen and result in a flat cup of tea). Green, yellow and white tea should be made with water that has boiled and allowed to cool for just under a minute. Proceed to pour the water onto the leaves or tea bags. This will saturate the tea allowing the flavor to release naturally. Do not pour the water and then add the tea, this will only result in a poor cup of tea. To steep your tea, cover it and let it sit for the allotted time (always cover your tea when steeping) this allows the tea leaves to unfurl properly. 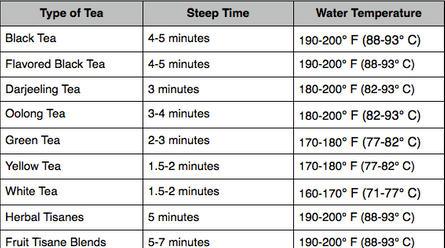 The different types of tea should be allowed to infuse for the required number of minutes at the appropriate water temperatures listed below. Make sure not to venture too far from your tea when it is brewing. 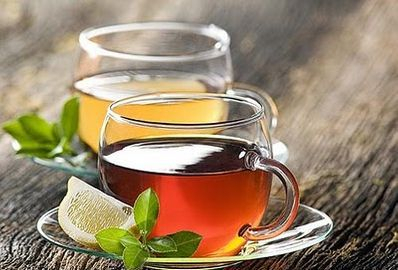 Teas take from as little as 1.5 minutes to 5 minutes to achieve their ideal brewing time. If you prefer your tea stronger or weaker, simply increase or decrease the amount of tea. Never vary the brewing time. If allowed to sit in the teapot, the tea can over-brew and turn bitter. Some green, oolong and white teas are good for multiple infusions- just add new hot water to the pot and increase the steeping time up a bit.